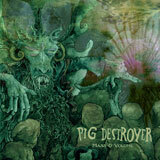 Another non-grind release from US grind titans Pig Destroyer. Released on physical format for the first time this autumn (October 14th), Mass & Volume was actually recorded during the sessions for the Phantom Limb album back in 2007. Having finished Phantom Limb with some time and resources left over, Pig Destroyer recorded the two extended tracks that make up the Mass & Volume EP in a single day. “Pat Egan was a friend and a keystone member of the Relapse family for many of the years we have been involved with it. He devoted his life to supporting underground music and he immeasurably helped develop the bands he worked with. His untimely passing on February 18 2013 shocked the many people that his life and work had touched. This EP is dedicated to the memory Of Pat Egan and to the loving family he left behind. RIP Pat. We know from their covers of Oven from 38 Counts of Battery, and Claude from the 2005 tribute album We Reach that Pig Destroyer are big Melvins fans, and much like 2008’s Natasha EP, Mass & Volume shows the slower, Melvins fan club side of the band. The two tracks on this EP are feedback-drenched spacious doom, but with less emphasis on the experimental ambience that you got with Natasha. And as the Arik Roper penned foggy green artwork depicting the requisite goat/demon/wizard hybrid suggests, this is Pig Destroyer’s stoner doom release. Phantom Limb was Pig Destroyer’s metal album, and it makes sense that a similarly uncluttered record in terms of style came out of the same sessions in the shape of Mass & Volume’s pretty clear cut doom offerings. If you want to be as reductive as possible, two metal records came out of one session, and Mass & Volume is the distended lumbering twin of the ferociously fast and violent Phantom Limb. Just two tracks make up this EP, but both are much longer than the manic concise assaults Pig Destroyer usually deliver. J. R. Hayes’ vocals are as demented as they’ve ever been, and whilst the riffs and artwork cry out bona fide evil stoner doom, the lyrics are about as far from satan and bongs as you’ll find on a record of this sort. With both the title track and Red Tar you get the usual stilted imagism; all insular and visceral, almost stream-of-conscious snips laid out in order. There’s some stuff about grief, and some sea-based metaphors about drowning and being lured in by sirens which all seems pretty heavy and fair enough, but I’ve no idea what the lines about ‘needing to kill a hawk’ are all about. None of that matters hugely to me though. While J.R. Hayes’ lyrics have never really struck a chord with me, I do think his style is fairly unique and has always helped set them apart from their grind contemporaries, and the same is definitely true of Mass & Volume when you compare it to any number of recent doom records. The EP has been available online previously, but on October 14th Relapse will release a run of 2,000 CDs and a limited coloured vinyl version. In such small quantities it’ll no doubt sell out faster than the double kick on Piss Angel and, more importantly, raise a lot of money for the family of a man who was clearly a big part of Relapse Records – a label Pig Destroyer have called home for more than a decade.